Do you know exactly what you're putting on your largest organ — your skin? The products we use on our bodies should be just as safe and clean as the food we put in our bodies! And one of the best ways to ensure this is to make your own bath and body products. It's easy to make your own deodorant, sunscreen, bug bite sticks, lotion bars, body butter, tooth powder and toothpaste, hair gel and hairspray, dry shampoo, and even soap — all at home! I still remember what convinced me to make goat milk soap — bringing home our first 2 dairy goats! Their arrival sparked new ideas, dreams, and possibilities. Like what scent should my soap be? What about texture, like coffee grounds or oatmeal? What shape? Thankfully, those type of decisions are the hardest part of the soap-making process. Although lye-based soap-making requires common sense and safety measures, it's very easy to do! First of all, goat milk soap is very gentle and pH balanced. So if you have dry or sensitive skin, acne, or eczema, this is the soap for you! Additionally, if you already have healthy skin, goat milk soap will keep it that way. However, if you don't have access to goat milk, simply substitute an equal amount of water in place of the milk in this recipe. In addition to these items, pour and stir the lye solution slowly and carefully to avoid splashing. Work in a well-ventilated area, and educate any family or friends present about the dangers of lye. Use only plastic, glass, or stainless steel containers when mixing the lye. And be sure to label them for soap-making purposes only! Remember that the lye in soap is still active until saponification (the chemical reaction that makes soap) is complete. This can take up to 24 hours. Finally, don't be afraid — just be smart! You will need the following supplies. Items marked with an asterisk come into contact with lye, and should be used only for soap-making. 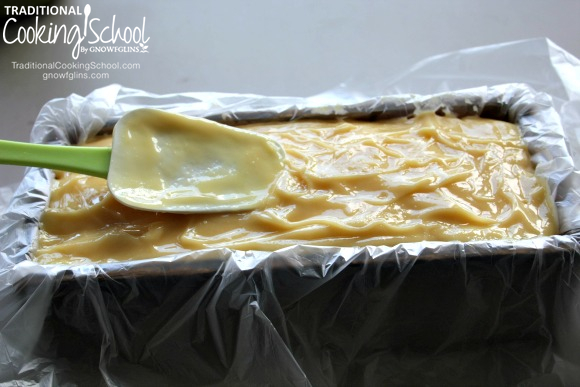 1. to convert (a fat) into soap by treating with an alkali. In other words, let's put on those goggles, rubber gloves, and face masks! It's time to make soap! I developed the following recipe using the SoapCalc website. The end result? A hard, creamy bar of soap with good lather and cleansing properties. All ingredients are measured by weight, not volume. Remember to place your container on the scale and tare it before measuring the ingredients. This soap-making method is called “cold process”. The bars need to cure for 4 to 6 weeks before using. Alternatively, “hot process” soap (like this) is cooked during saponification. This speeds up the process significantly, and means you can use the bars sooner. However, with hot process soap, you may lose some beneficial properties of essential oils due to adding them to a hot soap mixture. Prepare soap molds by lining with plastic, wax, or parchment paper. Weigh out goat milk in designated milk/lye mixing container. Set aside. Weigh out lye crystals. Set aside. Weigh out essential oils. Set aside. Weigh out coconut oil, lard, castor oil, and olive oil. Combine all in pot. Place pot over low heat until solid oils have melted completely. Remove from heat and set aside. Then slowly pour lye into designated milk/lye mixing container. The milk will start melting right away. Carefully stir mixture until milk is melted. Once milk and lye solution is combined, place container in bowl of ice water so it can cool down. The milk and lye solution shouldn't be hotter than the oils — it needs to be the same temperature or within 10 degrees Fahrenheit cooler. Check the temperature of the melting oils. I aim for it to be about 100 degrees Fahrenheit, with the milk and lye solution about 90 degrees Fahrenheit. 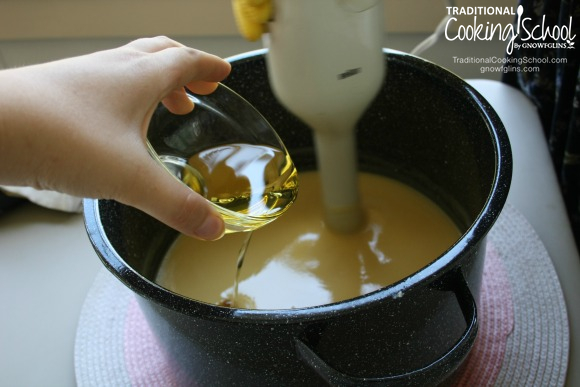 Once the milk and lye mixture is cool enough, carefully pour it into the pot with melted oils. Stir as you pour. And then stir some more! Stir, and stir, and stir until the lye solution and oils are completely combined and reach “trace”. Trace is the point where the oils and lye are completely combined and can no longer separate again. 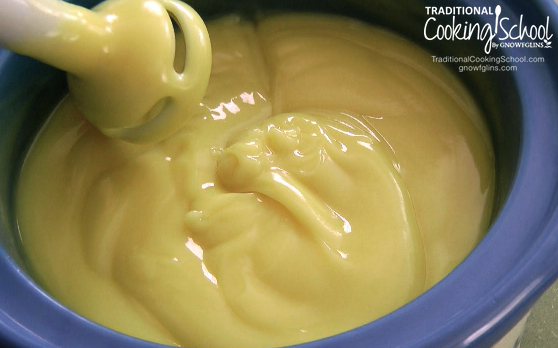 Think of it as emulsification, like when making mayonnaise. Test for trace periodically by pulling your whisk or immersion blender out of the mixture. Once it reaches trace, ridges and drips will form and won't go back down. It should be thick like gravy. Once you reach trace, add any essential oils. Pour in and combine well. Check for trace again. Then pour the mixture into soap molds, using a rubber spatula to smooth the top of your soap or create a nice texture. Keep in mind that the soap does not settle as it hardens. Finally, move soap to a cool, dark area and allow it to sit undisturbed for 24 to 48 hours. The lye can still be active for a while, so don't touch the soap with your bare hands until 24 hours is up! Now, look at the mess you've made! 😉 Wash any equipment used only for milk, oils, or fats (the container used to measure, the spoon used to stir, and thermometer). Anything used for the lye solution (container used to mix milk and lye, the spoon used to stir, thermometer, pot, whisk or immersion blender, spatula) should be placed together and allowed to sit for at least 24 hours before washing. When it's safe to touch the soap, it's safe to touch the utensils. Once 24 to 48 hours passed, unmold and cut soap into bars so it can finish curing. Simply flip the soap out of the mold, and peel away the plastic lining. Cut it using a knife, fishing line, dental floss, or a crinkle cutter. The bars of soap need to continue hardening and curing for another 4 to 6 weeks before use. Store the bars in a box, not touching each other so there is plenty of air flow. Flip and rotate the bars every few days so that all sides are exposed to the air periodically. Some people prefer to loosely cover the soap with a towel or lid, too. When soap is hardened and cured, it's ready to use! Put a bar by each sink, or wrap some up and give it to a friend. Enjoy the soft, creamy lather and wonderful scent — along with the satisfaction of a job well done! You now know exactly what you're putting on your skin! 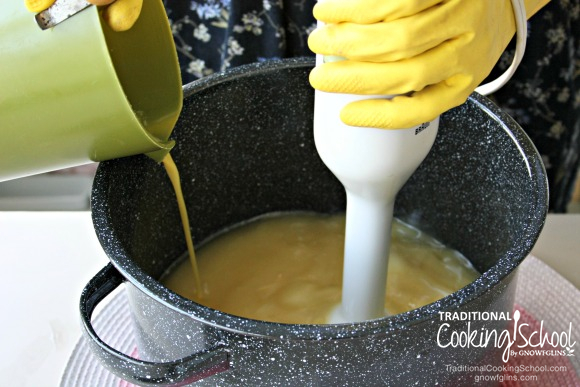 Have you ever made goat milk soap before? Will you give it a try? Lindsey is a twenty-something foodie. She lives with her parents and sister on Hickory Cove Farm, a small, natural and sustainable farm in South-Central Pennsylvania where they raise Alpine and Nubian dairy goats, a flock of pastured laying hens and a few roosters, and a few beef steer. She views her country life as a great blessing and wants to help others get back to eating simply with fresh and local seasonal foods. Her favorite place is in the pasture with her goats, but she also enjoys spending time in the kitchen, photography, music, a really good cup of coffee, and blogging at The Life Of Linz. Thanks so much, Lindsey. You’ve taken all the guesswork out with your great instructions and I’m moving this up on my priority list of things to try! i would like to know the same thing?? can you substitue any oil..for the castor oil and lard?? Can you use powdered Goats milk, and why must you freeze the milk? Thank you so much for such a detailed lay-out of how to make bars of soap! I did this with a friend about a year ago, and the soap worked beautifully with our sensitive skin. 🙂 I’ve wanted to make it again, but her schedule and mine have conflicted, so maybe I’ll try to make this myself using your directions. One question: using your sources for supplies, how much do you think it cost per bar of soap? I did buy three bars of naturally saponified soap online a few weeks ago, made in Greece, and each large 8 oz. bar was only about $2.60, so I’m wondering if I’d actually save $ making my own bars of soap like you’ve done. You’re welcome! I hope you’re able to try making it soon. Can store bought goat’s milk (in the refrigerated section) be used for this? I do not have access to fresh goat’s milk. Can you use cow’s milk in place of the goat’s milk? Hi there, just wondering why you freeze the milk and if it would be fine to use fresh unfrozen milk? I didn’t use frozen milk so if you want to prevent this, put the mixing container in ice cubes and then add the lye and mix. It keeps it cool and also speeds up the process of the cooling of the lye mixture. I have never mad soap. I would like to. This looks like a fun recipe and I have some goat’s milk from our goats. I have just been fraud to make it with small children are line. Do you have any tips for that? Is it safe to make in the house with little ones around? I wouldn’t make when small children are in the room, unless they were agreeable to wearing face masks and stayed well away from your work area. That’s a lot of essential oil. I looked up the eBay seller’s link and it comes to $25 for 2 oz. Just double checking on the amount needed. Could one get away with using 1 oz instead of two? I was thinking of lavender or vanilla. Thank you for this tutorial. I think I’m getting closer to trying it. Hi I was wondering if the lard could be substituted? Thank you for posting. Great step by step pics. Would this recipe work with cows milk instead of goat? Do you sell your soaps online? If so, website link. prices, scents. thanking you in advance. Not yet… 🙁 We hope to some day soon though! I am not sure about this. I didn’t read everything, quite honestly once I say the word: LYE, I got turned off more. The first thing that left me pessimistic was the “drain opener”? Now how organic is that? As well as the lye? OK, Needless to say I am ignorant when it comes to lye. Quite frankly I would LOVE SO MUCH to make soap for myself, and why not? I already made a pleasing scented body lotion. I have made an eye cream, but the more I read about other ingredient’s I could use, I look forward to making a new improved lotion for my mature skin. That’s a great question and a valid point, Cathy! I didn’t know how commercial lye is made, and I tried to do some research but got lost in the technical scientific jargon! Best I can tell, it’s made by electrolysis of a salt water solution, but beyond that, I don’t know exactly how. Chemistry was never my strong point! As I understand it, the saponification process, which is an acid(the fats)/base(the lye) reaction, changes the chemical makeup and produces glycerin and a salt, which is your soap. 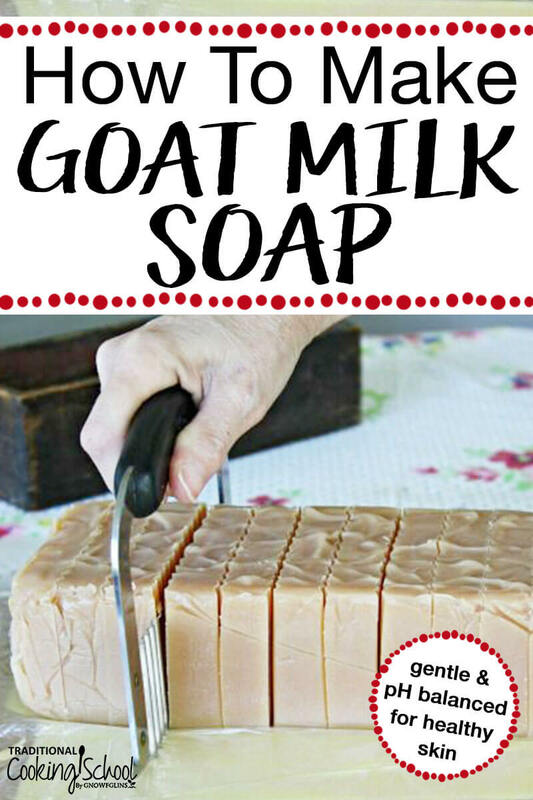 thank you for this, it seems to be the most detailed how to i have come accross for goats milk soap. i need unfragranced for my skin so i will leave out the essential oils but i do like goats milk soap with oats and honey in, would 2 ounces of that work instead? What size is the mold that you used? I have seen molds that hold either 4 or 6 lb. But I am not sure which size to use for this recipe. Thanks for your help, this is a great tutorial! This recipe makes about 6 lbs of soap. We don’t have specific molds – just the box and PVC pipe shown in the picture – but the total yield is around 6 lbs. I realize this is a older blog. Hope it finds you. What size mold are you using? Or maybe I should ask how many pounds of soap does this make? Never mind should have reads further. Can you use other oils than olive? Like Palm? Sunflower? I am a little Leary of using PVC for milk soap. 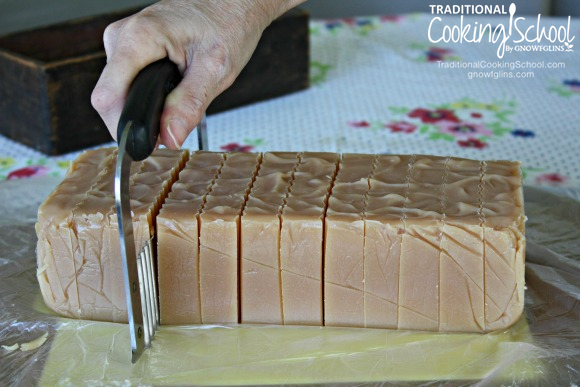 When I make goat milk soap I usually put it in the freezer for a few hours. I can’t get the PVC in my freezer, upright. Have you had any experience with this? I’m sorry it took me so long to respond, Linda – somehow I missed the last few comments on here! I’m trying to start a business with goat soap, lotions, shaving creams and such. Do you have any other recipe for these?? Also, where do you purchase your coconut oils and such??? Thank you!!! As of now, we only make soap, and this is the only recipe we use. We purchase our essential oils from the eBay store I linked to in the post, and we get our coconut and other oils from a discount grocery store near us. They don’t always have coconut, so if they don’t, we purchase it online from the Bulk Apothecary store. Hope that helps! Hi Lindsey! Thanks for the great tutorial! We made the soap this afternoon and all went well, but I have a question about the essential oils. We chose to leave them out all together because the only oils I had were small bottles of very expensive, organic, therapeutic oils that we use medicinally. The recipe would have taken 2 full bottles of our stock & I was just too cheap to do it ;). So, since the EOs are added after trace and are optional, why was it necessary for the total to be 2 oz.? I had thought about adding a smaller amount, but didn’t want to waste the EOs if the strength would be too weak. Hope that all makes sense! Hello AJ! I’m glad you were able to follow the tutorial and that all went well for you! The main purpose of the essential oils are for scenting purposes, so no, you don’t *have* to use the whole 2 oz. That amount, plus ensuring that the scents you mix contain one middle and/or base scent and not all top scents, just ensures your scent lasts longer. The formula for this “staying power” is 1/2 oz EO per lb of soap. So certainly you could use less EO, but the soap might not be as strongly scented when it’s finished curing, or the scent might not last as long as it would otherwise. The amount we use is one reason we get our soapmaking oils from the eBay store rather than use the ones we get for health purposes. I’ve just bought my first bar of handmade goat’s milk soap. I have allergy skin issues and I’m hoping it will give some relief. It’s a 7.5 oz. Bar and I’m looking for a way to store it while I use it. I bought it just for my face & neck. I’m usually back and forth between my house, my mom’s & my boyfriends, so it goes with me in my ”nessesity” bag. What should I do? Make sure the bar is dried out well before you put it in your soap case/bag. Since most soap dishes aren’t that great for drainage, we use a small plate with 5 or 6 smooth river rocks spread out on it, and then place the bar of soap on top of that. The rocks keep the soap off the dish and out of any water that drips off, and as long as you keep some spaces between the rocks, the air circulates well. Can I use the lard they sell in tubs at the grocery store? We buy pastured lard everyone in a while for cooking as it is so healthy. But is is so expensive! It would break my heart to use it for soap especially since this would be my first attempt and I am afraid I might mess up. Find a butcher and purchase some pork fat. There are two kinds, but I won’t bother you with that because I just use it all and don’t bother with separating it. There are all kinds of tutorials on rendering fat, that’s where I learned to do it. I rendered about five lbs. a few years back and still have some frozen in canning jars in the freezer. The butcher we use is Amish and I don’t have to worry about a lot of hormones, etc. that way. I think I paid about 50¢/ lb. for the fat. I made 3 batches of goat soap this past fall and it turned out good/ but you gave some good tips and the recipe a little different . I will try this one . I gave as gifts for Christmas and everyone liked . I use my goat soap exclusively- love it . Last a long time too. I am looking for a goat lotion recipe. I tried one but it was too runny and separated with oil on top and spoiled easily! Do you have a lotion recipe using goat’s milk? Thank you for sharing, great tutorial! Hello Lindsey Proctor, I just want to say that i love this recipe first of all. I am new to soap making and i am planing on making my first batch soon but i have a few questions. I was thinking about adding ground oatmeal as an exfoliate agent and use lavender oil, would it be okay if i just add it to the finished mixture of soap? Also, i buy a mint and patchouli goats milk soap for my self and my daughter and i was thinking of making it at home, do you have an y recipe for that? I bought canned evaporated goats milk (it was all they had in the grocery store). Will this work the same or do I need to add water to it? What do you do when the lye doesn’t heat up enough after pouring on frozen goats milk. I had that happen and put the bowl into a sink with warm water to heat it up to within 10° of the oils. Mixed it at about 90°. Most beautiful cream colored soap I had ever seen. Put my PVC molds into the empty sink (thank goodness) and filled them. Went to take them out of the sink and the bottom came out. All that beautiful soap down the drain, literally. Fortunately, I had some left in the pan that didn’t fit into the mold that I poured into a silicone mold and I saved three bars worth. I’m ready to get another batch made as those three bars were amazing. I will say that EVERY recipe I’ve ever made, I ALWAYS run through a lot calculator. When it comes to lye, I never take any chances. I want to make this soap. I’ve been looking for a recipe and this is the one I want to try. Thank you so much for sharing. I have one question. Where did you get your scale? Do you have a link? Or could you give me the name. Someone told me you need a good scale for precise measurements. Mine is simply a digital food scale that weighs out either grams, ounces or pounds. I would search Amazon and I’m sure many will pop up, or I believe I purchased mine at Bed, Bath and Beyond. Hello- I was wondering if you need to let goats milk soap cure for 4weeks if I use the goats milk base. It sets within a couple hours- in my cold garage. But wondering if I am doing something wrong. Thanks! I’m allergic to coconut, is there a substitute? I can’t find a soap recipe without it. Can this be done without using lye or any chemicals, just pure natural soap? It is pure natural soap! Read the labels of some of the soap you use. They are processes/made using Lye. Ie: sodium palmate, sodium cocoate.